*For local timings, Please refer your local Panchang. The fifteenth day of the dark fortnight (The Amavasya) of Magha Maas (As per Purnimanth Calendar) is called as Mauni Amavasya. Mauni Amavasya is the last Amavasya before Maha Shivarathri. It is also called as Maghi Amavasya. Mauni or Maun means silence, on this Amavasya day Maun Vrat should be observed. Maun (Silence) Vrat is to control all our senses. 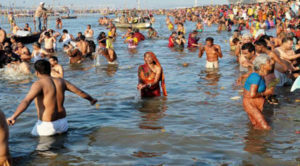 On this day taking bath in holy rivers, along with fasting is considered very auspicious. As per Hindu scriptures, The universe was created on this day. It is believed that Manu Rishi born on earth on this day. The Sun and Moon enter into the Capricorn sign on this day. It is believed that practicing austerities helps to purify one’s existence and the easiest way to do so is through a vow of silence. This day holds extreme importance in the Hindu religion and taking a bath on this day in holy waters gives freedom from the clutches of materialistic comfort.